One form of learning event took the format of public art exhibitions. This methodological approach was piloted by the Sustainability Institute in partnership with the Centre for Complex Systems in Transition (CST) and the SAFL. These art exhibitions centred on the use of visual texts such as film and photography to catalyse diverse groups of stakeholders around shared visions of the food system. This was used to co-generate deeper understanding about the challenges facing the food system and elicit non-academic responses about how to respond. Public art exhibitions were convened in Cape Town and Stellenbosch and a mobile version developed to accompany other SAFL learning events elsewhere. These were successfully used at the Stockholm Resilience Centre and the World Nutrition Congress at the University of Western Cape. The exhibition, Food (R)evolutions, features award-winning artists from across the world. The original exhibition was launched in Ethiopia in July 2015 and has been extended to other parts of the country, together with a monitoring process to capture stakeholders’ experiences and learning from the exhibition. It pays tribute to the period of hyper-evolution in which the African continent and its food system currently finds itself, as well as the positive, revolutionary, potential of this position. This visual journey across the globe’s food system uses the diets of day-to-day citizens from all walks of life as a broad text interspersed with specific themes. These focused themes are what food costs for families and what people eat in South Africa, nutrition and the African child, the African city, and politics, power, climate change and the changing landscape of African agriculture. spoken) in response to the exhibition using participatory narrative inquiry as a method of engagement. Participants were asked to interpret particular images or stories as a way to elicit narrative interpretations. 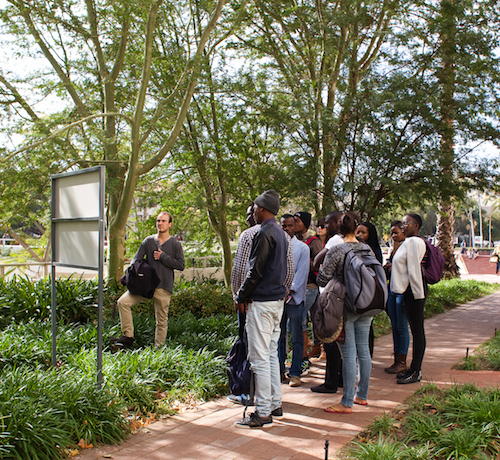 As part of a dialogue walk, participants convened around the iMadiba Project by a local artist, Erhard Thiel. This is a three-dimensional cement replica to scale of the floor plan (and bars) of Mandela’s prison cell on Robben Island. It is placed in view of the Law Faculty where seeds of apartheid-era legal structures were sown. The artist intended the work as a space where people can ‘speak out from’ and will be used to discuss the University’s role in the broader food system. A film capturing these exhibitions is available at: https://vimeo.com/179168461. For further information, please contact the SAFL Director, Scott Drimie at scott@southernafricafoodlab.org. The Centre for Complex Systems in Transition (CST) in the School of Public Leadership at Stellenbosch University (formerly known as TsamaHUB).